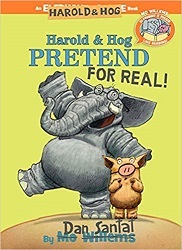 This entry was posted on Monday, January 28th, 2019 at 12:35 am and is filed under Animal Characters, Delightfully Silly, Easy Readers, Picture Book Review, Starred Review. You can follow any responses to this entry through the RSS 2.0 feed. You can leave a response, or trackback from your own site. I’m sitting here looking at this HUUUUUUUUGE Feedly list of book reviews I technically need to catch up on (do I NEED to? Can’t I just skip them and buy books I’ve already read reviews on?!) and feeling REALLLLLLY not like doing it, and then I opened this one and laughed out loud, even attracting my coworker’s attention. So thank you, this review was just what I needed to remind me there’s a reason I love my job!